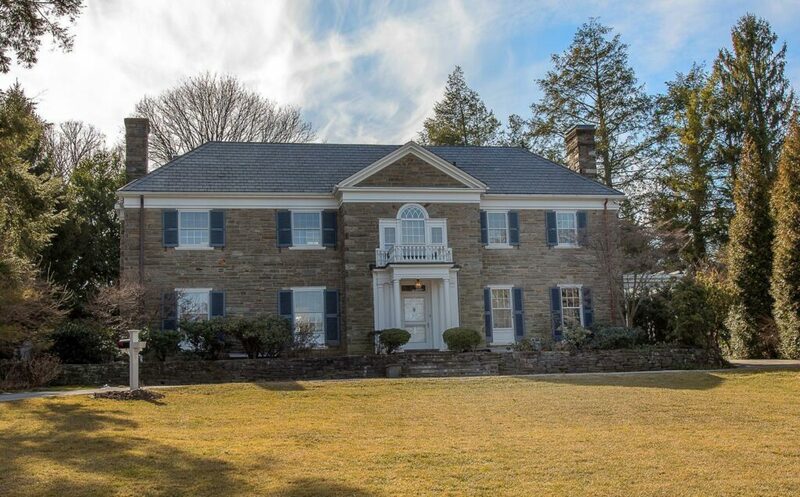 Cheswold Hill Road in Haverford leads thru beautiful grounds, gentle topography and among the Main Line’s most gracious and valued houses in a neighborhood that only 100 years ago was Mrs. A.J. Cassat’s beloved 54 acre sanctuary, ‘Cheswold’. 234 Cheswold Hill Road is 10 minute’s walk to the newly renovated Merion Cricket Club and SEPTA train station at Haverford, Haverford Square, Green Engine Coffee and Haverford College’s beautiful campus, arboretum and nature trail. The house is a prominent and dignified, three story stone manse of 6000 square feet with classical old world charm. 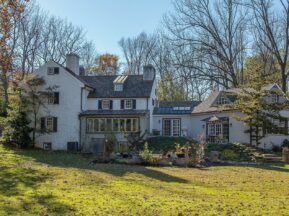 Renowned builder Pasquale Beccia constructed this house as he did all his great houses along the Main Line – almost entirely of hand cut stone and slate. Thus, 234 Cheswold Hill has the best architectural pedigree, with features and qualities of the period, beginning with the location of the lot within the neighborhood. The grounds are in keeping with the house, including the generous scale and wide frontage of a large, deep premium lot. High, rectangular east and west stone chimneys. Master bedroom suite with sunny afternoon balcony overlook, private patios open all along the back of the house for indoor to outdoor living in season, with a fountain, pool and pool house with half bath and kitchenette. Three family rooms. Attached three car garage with easy turn out to double width driveway at the front that easily accommodates numerous or larger cars without any congestion or stress. All naturally sheltered from the bustle of busy roads and speedy cut thru traffic for truly peaceful living.Wide stone steps to the front door portico. Enter the two story center hall with coat closet, elegant step up to the foyer with transverse hall, beautiful carved staircase and large, formal reception rooms. Hall to paneled library with fireplace, built ins and private veranda. Powder room with both vanity and true WC. Large eat-in kitchen is white with white tile, granite tops, new floor, new stainless steel appliances, new double ovens, dual dishwashers and double sinks. Office command hutch, back door to patio. Back kitchen hall for basement, back door, maid’s stairs and garages. Dining room has hand pegged hardwood floors, sunny landscape bay window wall to patio at rear, and opens to family / great room. Formal living room has hardwood floors, dentil moldings, gas fireplace, elegant windows to front views and opens beautifully thru two double doors to the rear-set family / great room, which easily completes excellent first floor flow for both daily family life and any seasonal entertaining or hosting requirements.Master bedroom suite allocates nearly half of the second floor. Bedroom has fireplace and his and hers bathrooms, private roof deck and balcony, her dressing area in addition to the master retreat dressing room, all with large closets, beautiful hardwood floors and big bright windows. Large second floor landing at centennial window for beautiful natural light and privacy. Cross landing to two family bedrooms off smaller foyer, both with big windows and large closets, hardwood floors. Both share full, modern hall bath with twin bowl vanities. Back hall to oversize fitness or yoga studio or a teenager’s family room, with half bath and laundry. Back stairs descend to kitchen. Steps up to third floor with two more family bedrooms, both with beautiful hardwood floors, cozy, bright dormer windows and closets, both sharing full hall bath. Attic storage.Lower level has third half bath, third family room with daylight windows and plush carpet, fourth fireplace and full service bar with wine storage and refrigeration. Unfinished portion of basement has immense storage rooms, mechanicals, additional laundry location and two separate stair cases to first floor.Pool house has dressing area and half bathroom, kitchenette with microwave and refrigerator, storage.